What can I do to receive the priesthood in my life? A Samaritan woman left her village to journey to a water-well, which served the surrounding villages. Women typically journeyed there to collect water for their households in the early morning and the late afternoon. Women would use the water to clean their homes and families, feed and even assist in healing their families aliments. The women socialized together as they took turns to help one another pull heavy water from the well and carry it back to the village. Our Samaritan woman made the journey around noon- for she was a sinner and an outcast, and wished to avoid the humiliation of struggling with her water alone. She arrived and found the Savior sitting at the well. He, having no flask of his own to fill, defied the civil custom of ignoring the rejected woman, and bid her to serve Him some water. When she hesitated, the Lord looked into the well and observed, “Whosoever drinketh of this water shall thirst again…” then turning to her he continued, “but whosoever drinketh of the water that I shall give him shall never thirst; … the water that I shall give him shall be in him a well of water springing up into everlasting life.” (John 4) As the woman listened to the Savior recount circumstances of her life that only a prophet could know, He demonstrated that He knew her. As He promised her participation in her eternal life, her testimony that He was the Messiah deepened. With new confidence, and surely the accompaniment of the Spirit, she returned to her village, and bid its people to follow her to the feet of Christ and the living waters he freely shared with them. In the context of my talk today, I thought of the woman whose life so quickly changed as she encountered this man. He taught that just as He, sitting there with no cup for water needed her help to drink the water of the well; so she, an outcast and sinner, needed the help of a Saviour to cleanse and redeem herself and gain eternal life. She was healed and started on her own journey to salvation. 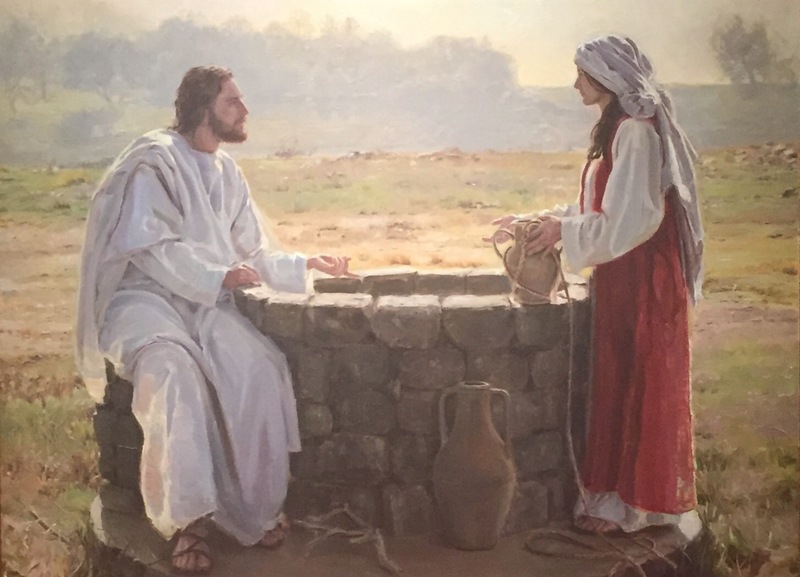 Along this long and wearisome journey, the Savior volunteered to represent her “living water”- He would sustain, heal and cleanse her without ration if she invited it. The service she would receive was as poignant as the effort she herself exerted on this road to exaltation. I thought of the cup-less Savior and of the lone woman at the well. Was I like them? Did I seek the help of another to lift my burdens and make me whole? What power in my life could I ask for that would make me whole? What could sustain me on my journey to exaltation? How could I actively contribute and account for my salvation? · the marriage sealing, the highest ordinance of the house of the Lord, available only jointly to a man and woman together. · setting apart officers and teachers. Men and women alike can come to know God as they seek out the blessings of priesthood ordinances in their lives, available through the power and authority of the Melchizedek Priesthood, “which heals, protects, and inoculates every righteous [man and] woman against the powers of darkness.” (Sheri Dew) How empowering to know that a merciful Savior waits at the well, for us only to ask and receive His divine help and priesthood power. God covenants with us that when we accept the ordinances of the priesthood and covenant with Him through Priesthood power, two things happen: (i) we intimately “receive” God; we draw nearer to Him, and (ii) we stand to inherit all that He has if we remain faithful and endure to the end. We learn from the sealing covenant, that all God has includes “Thrones, kingdoms, principalities and powers, dominions, all heights and depths” (D&C 132:19). These boundless gifts follow our covenant to receive the priesthood; to seek His servants and divine help in faith. How simply we can fit that into one sentence… but its practice seems far from simple! My father travelled a lot as our young family grew. While he was away one night, my young brother, then seven, awoke from a terrifying dream. He had a fever and became very sick. My mother rushed to his side to soothe him and asked, “What can I do to make everything better?” Having learned about Priesthood Power that day in primary class, he answered, crying, “I want my home teachers!” Wishing it wasn’t the middle of the night, my mother called on our Home Teachers, who donned white shirts and ties, and drove thirty miles in the middle of the night to come to my brother’s aid. He told them about his primary class, and they told my mother sleepily that they wished his class had been on personal prayer. Regardless, his faith, and my mother’s seeking was every part the power of that priesthood experience as the gift of healing itself was. The woman with the matter of blood raced through the streets to merely touch His robes; the centurion knew the Lord could heal his servant from scores of miles away; Zacchaeus climbed a tree just to glance at him and be made whole; the friends of a paralyzed man broke apart a roof to lower their friend to his feet. Many more stories tell of faithful disciples who faithfully drank of the living waters. Never has this rang more true than today. We live in a time where the world mistakes Gods ways as antiquated and gender-exclusive. The act of seeking and receiving the power of God is skewed by misconception. Many come to the well of water alone, with cups and buckets and say they ought to be able to struggle home with them all by themselves. The adversary confuses our understanding of Priesthood roles and service; he says men must be more important; women must be lesser-trusted of God. He says men and women should be entitled to this glory separately; he removes the need for us to humble ourselves and to act in faith. He tells us glory is in power and not in seeking or faith. Reflecting once more on the Lord’s oath and covenant of the priesthood, let me ask each of you a question: What can you do to receive (to invite, to seek, to have faith in) the priesthood in your life? My brother, serving as a full time missionary in Switzerland, recently recounted an experience to me. He has been serving in a small branch with a family whose grown-up daughter had long since left the church. She had rejected many of the principles of the gospel, and struggled to know if God knew who she was- if He was even there. Out of the blue, and in the midst of great trial, she exhorted her mother to find the missionaries for her- she needed a blessing. When presented with the missionaries, the mother told her in French far too complex for my brother to understand that his companion would be a better choice to pronounce the blessing- for my brother’s French was rudimentary and broken. She defiantly asked my brother to give the blessing anyway, and explained that he could even give it in English- she just wanted to feel the priesthood power that she had been missing for so long. My brother laid his hands on this strangers head, momentarily relieved that he could perhaps give this blessing in English. What happened next, he said, he couldn’t explain. In French more perfect than he was capable of speaking, he spoke melodically and confidently. The blessing was long and eloquent. He finished to the astonishment of the silenced family, and to the girl, who with tears streaming down her face rose and silently crossed the room to her handbag. From it she pulled her patriarchal blessing, which she had read over and over for weeks before this meeting, slowly plucking up the courage to ask to priesthood help. She told my brother that he had unknowingly recited sections of her patriarchal blessing. Surely this sister’s brief encounter with priesthood power left her feeling known and loved of God, confident that the Savior would advocate for her. I testify that priesthood power is really the power of God on the earth today. I know that it is the most necessary component of the restoration of the Church in these latter-days. It binds, it strengthens and it heals, and my faith has a part in it. I know that the pure womanhood my mother exhibited in our family home nurtured my father’s and brothers’ righteous use of it. Her example, teaching and encouragement entrenched deep testimonies in their hearts that prepared them to be the Priesthood servants. I testify that seeking the Savior through priesthood ordinances brings us closer to God, and makes us heirs to all he has. I’m in tears. WHAT a story to end with. How amazing and real is the Priesthood. Thank you for this most beautiful post!